Starring: Jack Benny, Fred Allen, Mary Martin, Eddie ‘Rochester’ Anderson, Verree Teasdale, Virginia Dale, The Merry Macs. In Love Thy Neighbor, Jack Benny is preparing his New Year’s Eve radio broadcast but takes time out to take his valet Rochester to meet his girlfriend Josephine arriving on a steamer. Fred Allen and his sister Barbara are also enroute to the dock to meet Barbara’s daughter Mary, returning from a personal appearance tour in South America.Their cars get involved in an accident and, in a bumping contest, Fred reduces Jack’s old Maxwell to junk, and is taken to jail, and the feud is on again. 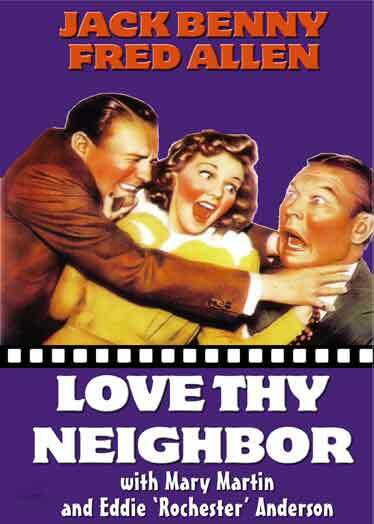 Love Thy Neighbor was produced to capitalize on ther famous radio feud between the two radio comedians. They were actually buddies in real life. 1940 – BW – 82 Minutes. This entry was posted in Nostalgia Merchant and tagged Comedy, feud, Fred Allen, Jack Benny, Radio stars, rare classic movies.